Imagine if I took a polaroid of myself, let you see it, and then after (maximum) ten seconds took it away from you. You might find that strange, annoying even. Then, imagine if I, or your favourite brand (Adidas) used this as a method of communication. Frantically taking photos or videos that, in the end, would not be kept. You don’t actually have to imagine this, because through the mobile application `Snapchat´, you can experience this virtual and fleeting interaction whenever you like. The funny thing is that this has caught on, and it´s working. Snapchat is a very competitive `new media´ app, with an average age of eighteen (DeMar et al, 2016). It is “characterised by disappearing posts” and has rapidly become the third most popular social media app used by young people (Bayer et al 2016). Snapchat declined the $3-billion payout Facebook offered in 2013 and since has, remained a strong player (Holloway). With a constant stream of updates, Snapchat remains a `new´ media product despite having been around for several years. The media ecology of software, and the constant motion in this field is characterised by a need to keep up with competitors such as Facebook, Twitter and Instagram (Manovich). This has been met in various ways. Snapchat has added more text capacity for pictures alongside a `chat´ sideline, photo filters, stickers (to represent emotions), Snapcash (a quick way to pay back friends) and the ability to create a `Story´ of your day, and save it, (if what you did was too hilarious to lose after 24-hours) (DeMar et al, 2016). All of these features still remain true to the ideology behind Snapchat, and are built on the software it originated. They also develop Snapchat to be a method of communication that competes with Facebooks `messenger´ mobile app. Additionally, Snapchat shows the innovation required in media ecology to develop an environment providing the user with multi-layered opportunities (McLuhan). Why bother using four applications if one can perform all of the functions at once? Millions of people have started making Snapchat a part of their day-to-day life, showing how culture can grow through a medium, and how habits are made through that (Postman). Snapchat `culture´ also provides the `Discover´ feature, developed in January 2015 which “allows users full access to videos and articles from sponsors” (DeMar et al, 2016, pg 195). The beauty of this is that users choose if they want to `discover´, and true to Snapchat’s software, the content is renewed every 24-hours. This feature has developed within itself since its arrival last year. Now, it is possible to `subscribe´ to a channel of interest. 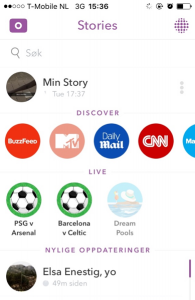 Furthermore, straight underneath the `Discover´ feature is `Snapchat Live´, where a selection of posts stream as they happen. The concept of Snapchat-Live, Snapchat-Discover and Snapchat´s fleeting content all conjure questions about social media time versus real time (Barnett et al, 2016). They not only provide an environment in which to share and communicate in, they also provide a time frame in which to do this. Thus, Snapchat underlines a key concept behind `new´ media, that it is an ever moving channel that cannot be static to be successful. Snapchat claims the sneak previews into behind the scene footage from ´Discover´ are unique, as they “are not social media” (Snapchat). Social media, frequently by using algorithms, suggest our preferred reading based on popularity and `trends´ (Gillespie), yet Snapchat’s `Discover´ is produced by artists and editors of the companies posting. An example of this was Pharrell Williams joining forces with Adidas Originals and leaking snaps before the launch event to engage users (Amerman).This implies that quality, not quantity is important, which is reverse to what literature on other platforms and algorithms suggests (Manovich). Plus, the short-but-sweet nature of the app allows quick sneak-peaks that appeal to younger audiences. Also, remember that $3 billion Snapchat rejected from Facebook? By providing a platform for advertisers to reach a new audience using sensory affordances that are visually stimulating and engage the user with visuals, dialogue and sound (Stanfill), Snapchat is able to monetize and generate profit. The constant development of the Snap-environment thus is a well thought out business plan, enticing users on its way. It is clear that Snapchat is a successful mobile application with many features that have expanded its usage. The quick paced nature of the app, with posts lasting no more than 24-hours symbolise how social media platforms have changed our way of perceiving time. In technology, everything is instant, and goes as quickly as it comes (Bayer et al, 2016). This being said, it is important to keep up, and by developing `Discover´ and `Live´ Snapchat has opened up a world of sneak-peaks, and exclusive footage, creating revenue for itself, all the while characterising media ecology through it´s software development (Manovich). My phone died yesterday, and I was confronted with a harsh life excluding Snapchat; the inability to share my attempt at building a second piece of Ikea furniture. The design of habits and culture created through a medium relate well, once you´re in, it is hard to be without (Postman). So, I guess I´ll buy myself that polaroid camera after all. Amerman, S. How Brands Can Brace Themselves for Snapchat’s New Algorithm. 16 June 2016. 15 September 2016 <https://www.sprinklr.com/the-way/get-ready-for-the-snapchat-algorithm/>. Barnett, K, et al. ““Snapchat is more personal”: An exploratory study on Snapchat behaviors and young adult interpersonal relationships.” Computers in Human Behaviour 62 (2016): 594-601. Bayer, J, et al. “Sharing the small moments: ephemeral social interaction on Snapchat.” Information, Communication & Society 19.7 (2016): 956-977. DeMar, M, A. R Jassamalla and H Sashittal. “Building acquaintance brands via Snapchat for the college student market.” Business Horizons 50.2 (2016): 192-204. Gillespie, T. Algorithms, clickworkers, and the befuddled fury around Facebook Trends. 18 May 2016. 15 September 2016 <http://culturedigitally.org/2016/05/facebook-trends/>. Holloway, D. “Snapchat Gets in the ‘Not Social Media’ Game.” Broadcasting & Cable 145.6 (2015): 24. Manovich, L. “Media after Software.” Journal of Visual Culture 12.30 (2013): 30-37. McLuhan, M. “The Emperor´s Old Clothes.” Kepes, G. The Man Made Object. New York: George Braziller, 1966 . 90-95. Postman, N. “The Humanism of Media Ecology.” Proceedings of the Media Ecology Association 1 (2000): 10-16. Snapchat. About Discover. 15 September 2016. 15 September 2016 <https://support.snapchat.com/en-US/a/discover-how-to>. Stanfill, M. “The interface as discourse: The production of norms through web design.” New media & society 17.7 (2015): 1059-1074.